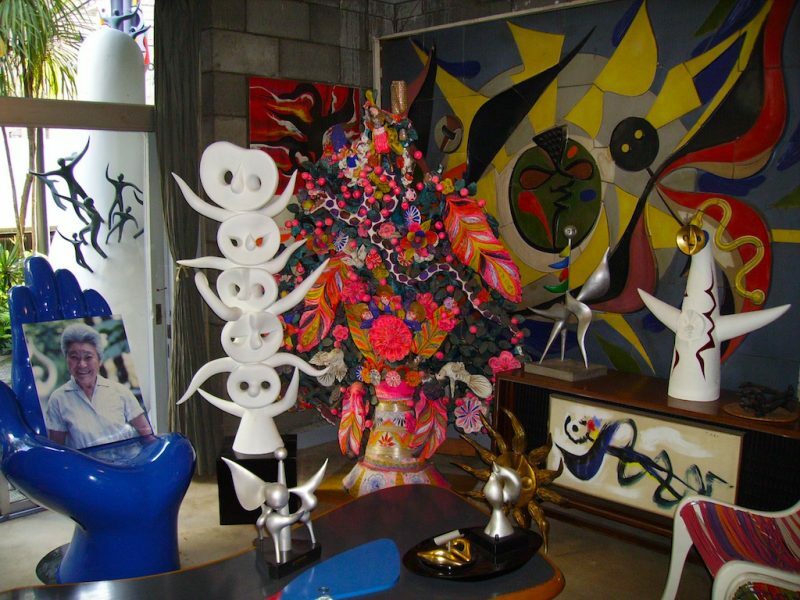 Don’t miss this gem of a gallery if you’re in Tokyo, the home-come-studio of Japanese avant-garde artist Taro Okamoto. It’s a little off the beaten track in Omotesando, one of my favourite spots in the Japanese capital. It’s been five years since I was in Japan last and I visited this little gallery/museum. My friends and I had discovered it many years before even, when when we were in the city for Golden Week. We were blown away by the colour bomb that awaits the visitor inside. 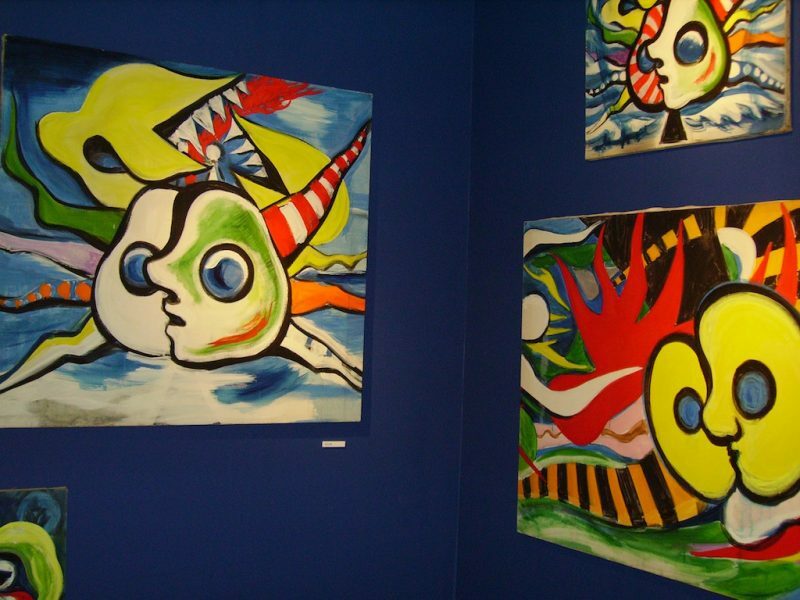 A visit to the building will bring you face-to-face with quirky and vibrant installations, paintings and statues. 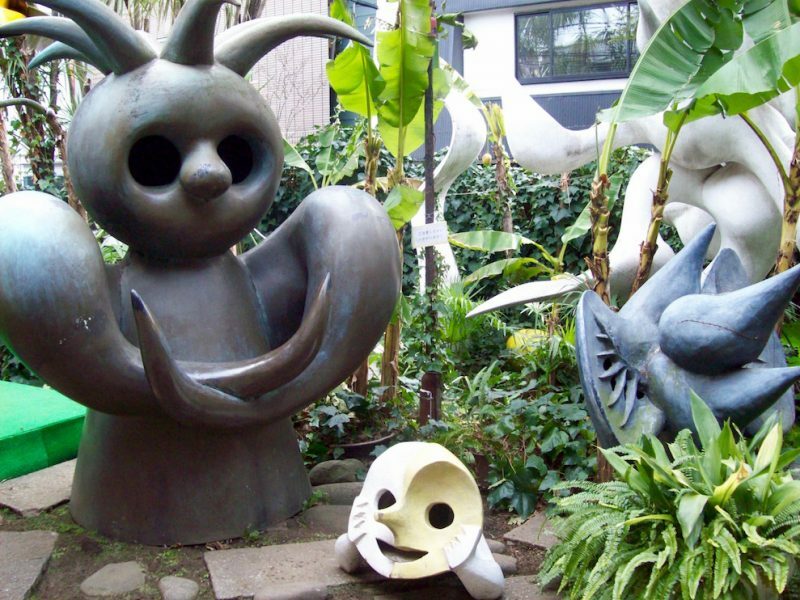 This being the former home of Taro Okamoto, his work spills out into the garden too. It’s not every day that you’re asked to take your shoes off to enter an art gallery. Nonetheless, it’s a habit I was more than happy to bring back from Japan. These photographs are from two different occasions, hence the different hair colours. 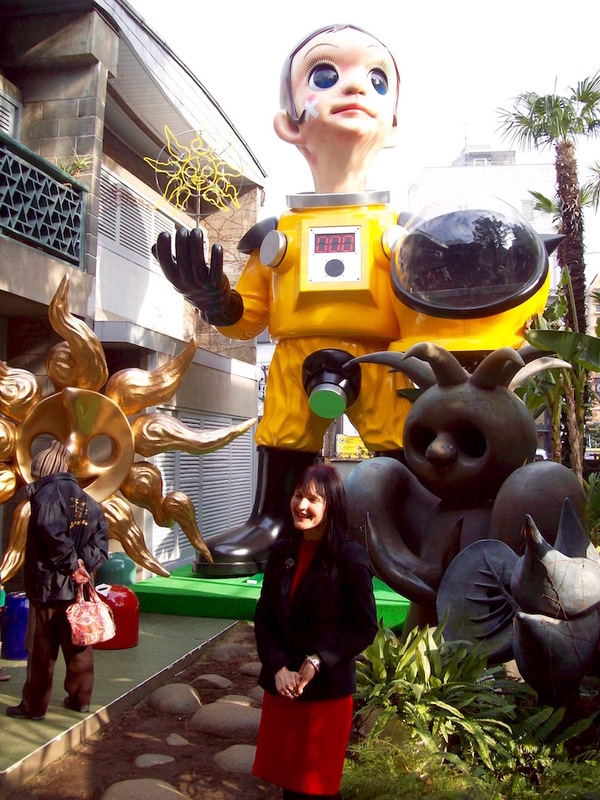 I lived in Japan for eighteen months from 2006 to 2008 and returned in 2012 for an all too short holiday. And yes, I’m definitely going back there again one day. Take a look at the museum’s website (English translation available) for directions. Read more about Taro there too, including the amazing story of his Myth of Tomorrow mural. I didn’t know this artist before I went to Japan and don’t pretend to know a lot more now. We stumbled upon this bizarre oasis simply because we were looking for the nearby Subway for lunch and were lured in. 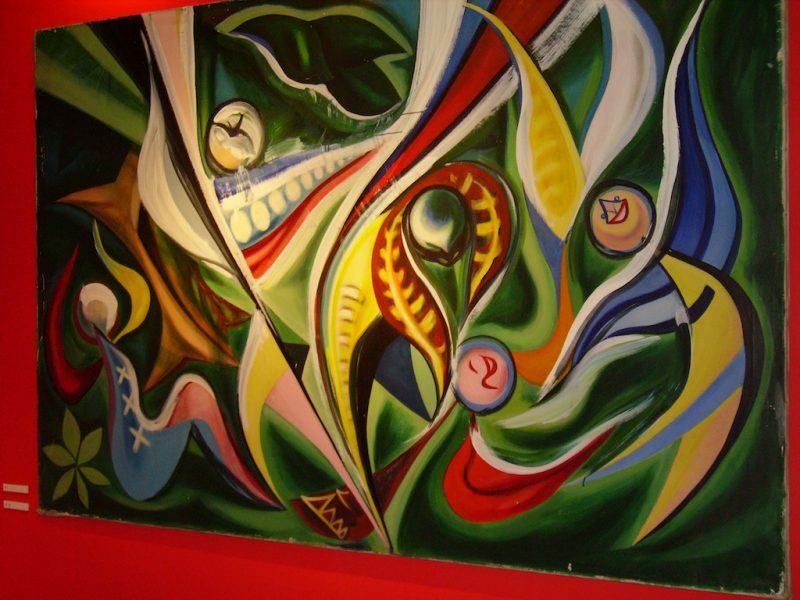 Most of all, the huge, colourful canvases with their abstract figures and faces won us over. Art won the day – or lunch at least. I have to admit to a touch of the green-eyed monster here. Not only was this man did this man find fame in creating weird and wonderful art – including this which now lives at Shibuya station – he had an enviable address. It’s crazy to think that this was ever someone’s home and a wonderful way to showcase his work to his fans. Inside the house you get a sense of how prolific an artist he was, as well as versatile. Paintings, sculptures, ceramics and video – and you’ve not even seen the garden yet! As you can probably tell, these are not things you can pop on your mantlepiece. They’re huge! It’s a good job Taro had a garden, though I imagine he created them because he already did and wanted to fill it. 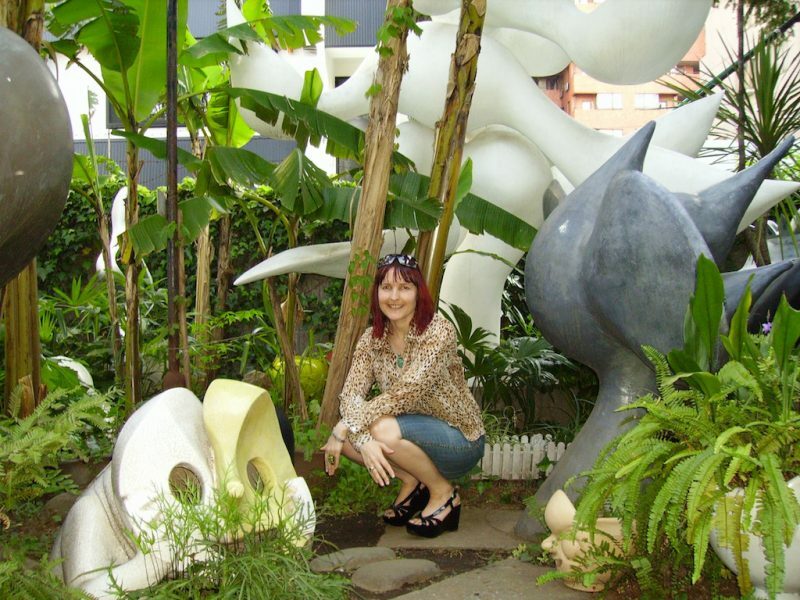 There are organic shapes hiding within the foliage and pot plants, some of them owl-like. 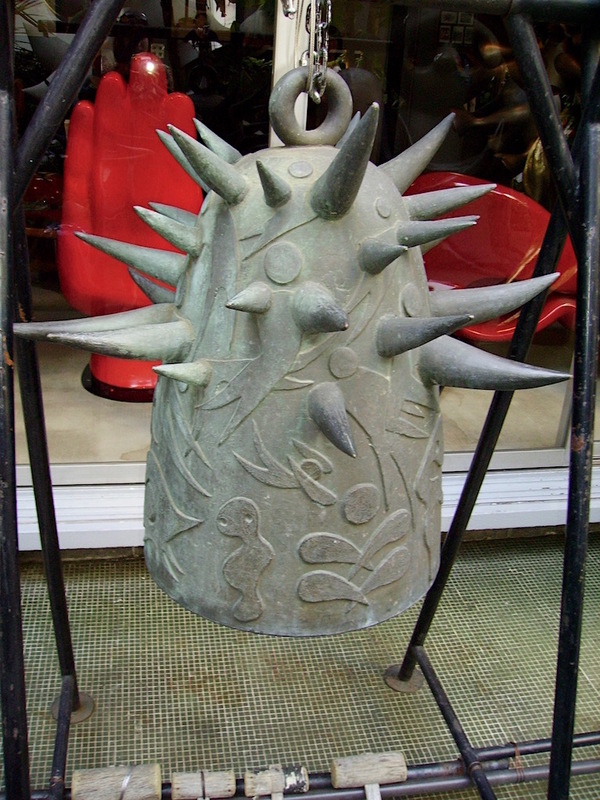 You’ll also see a temple-like bell with relief sculpture that invites you to ring it – the spikes make different sounds when you do. Treat yourself to coffee and cake from the cafe in the garden if it’s sunny while you take it all in. You’re pretty close to some cool parts of town here. Harajuku, the Camden Market of Tokyo, is a short stroll, and you’re close to plush shopping areas. The long tree-lined boulevard puts me in mind of Bond Street in London, which is the kind of shopping area it is! You could quite easily spend a day here taking in the sights and people-watching. What’s more, there are a couple of vegetarian/vegan eateries in the vicinity. The Brown Rice Cafe has some good reviews while the Hiroba Organic Restaurant has a good selection of veggie dishes. Seems like Japan has become more vegetarian-friendly since when I was living there, in the cities at least. My advice is to check out the Happy Cow website where there’s a growing list of meat-free restaurants. 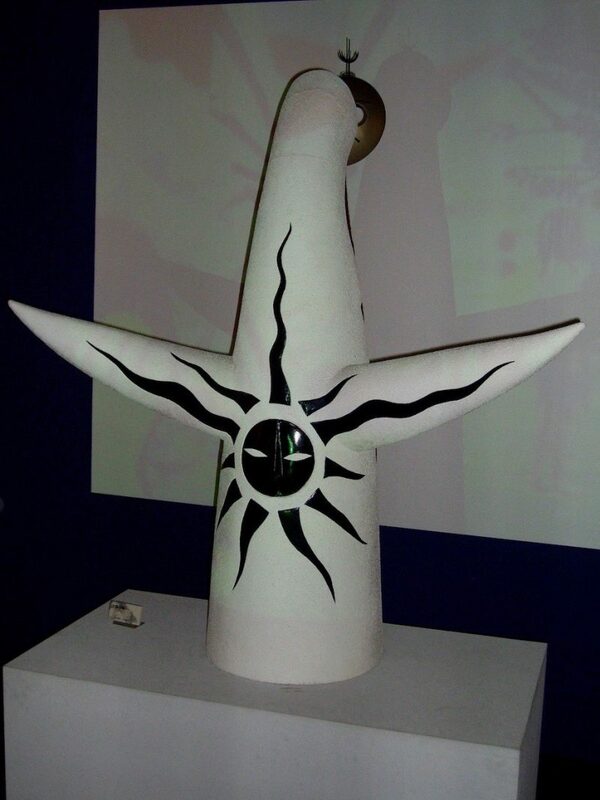 This is a much smaller version of Taiyō no Tō, Tower of the Sun in English. The real thing is near Osaka close to where I was living and is visible from the train journey to Koyasan. Incidentally, you can buy this as a keyring at the museum along with lots of other arty souvenirs. Meanwhile, if you like Taro Okamoto there’s more of his work you can see in Kawasaki. Seems like he’s a popular guy in Japan and it’s a new place for me to try next time I’m there. Have you been to Tokyo? Where would you recommend I visit next time I go?